Han Solo is once again back on the big screen this time with Alden Ehrenreich taking the reins and very adequately making the character his own. 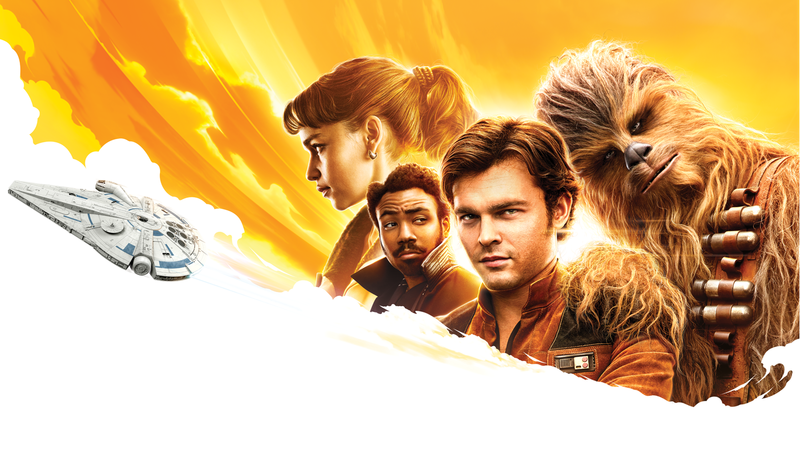 In Solo he embarks on a journey that has him meeting Chewbacca (Joona Suotamo) and Lando (Donald Glover), getting his hands on the Millennium Falcon, and making it through the Kessel Run in less than 12 parsecs. There is quite a bit that happens in this movie, some small and clever callbacks to the previous Star Wars films, as well as one big moment that will make more sense to some more than others but still a big surprise nonetheless, one that could have major repercussions in future Star Wars spinoffs. First I want to talk about a couple of story related moments in the film which make for some pretty damn cool moments. Theres a sequence when Han and Chewbacca infiltrate the spice mines on Kessel to steal some of the much sought-after coaxium and during their escape come across another group of Wookies. I liked the presence of these Wookies for a few reasons, first I loved seeing more of the Wookie race represented on screen other than just Chewbacca because it really doesn’t happen that often. And secondly it’s this sequence that really shows Chewbacca’s life debt to Han Solo for saving his life. In the moment he has the option to escape with his people and I’m assuming return to Kashyyyk but he chooses to stick by Han and protect him, a devotion that we know never dies. Solo also gives us the origin of the name Han Solo in a pretty cool and somewhat amusing moment but one that isn’t needed. In the scene Han goes to enlist for the Empire and in doing so it’s understood that he doesn’t have a last name, so the recruitment officer knowing he’s alone gives him the last name Solo and I guess it stuck. Like I said, a cool little moment but I don’t think anyone thought even for a second ever there was more to his name than it just being his name. Enfys Nest who we now know is played by Erin Kellyman is a character who doesn’t show up a whole lot throughout the movie but when she does appear I thought she looked pretty badass. In the film she’s the leader of the Cloud-Riders and spends the movie cleverly tracking Han and even just in terms of the way she looked made an impression on the film. I’d love to see more from Enfys Nest as she doesn’t really do a whole lot and could be a more involved player in a sequel. I didn’t mind the reveal of her identity, I definitely didn’t expect it, but still thought it was fine. That scene also reveals Warwick Davis‘ role in the film as one of the Cloud-Riders. Now for some of the more juicy Star Wars connections and references. There’s an awesome moment during the sequence in which the crew are infiltrating the spice mines on Kessel where we see Beckett (Woody Harrelson) donning a pretty familiar disguise. If you recall, the disguise he is wearing is the same getup Lando used to infiltrate Jabba’s Palace in Return of the Jedi (1983). This is probably the same one that Lando ends up using later on which does reveal one more thing to us… that Lando and Beckett wear more or less the same size clothing. Speaking of Jabba, he doesn’t appear in the flesh but the movie drops two references to the infamous gangster on Tatooine. Before Beckett pulls a fake early exit he mentions how there’s a crew being put together on Tatooine by some gangster… a line that could only be in reference to Jabba. And then right at the end of the movie Han mentions that he and Chewbacca are headed to Tatooine to meet with the gangster Beckett mentioned. This is setting the groundwork for having Jabba appear in a possible Solo sequel. One connection to the original trilogy we unfortunately didn’t get is the presence of Boba Fett. He’s nowhere to be seen and not even referenced but I’m sure that if we do end up following Han in a sequel we will definitely run into Boba Fett when Han pays Jabba a visit. In a couple more connections to the other films we see Han conquer the Kessel Run in under 12 parsecs when it was previously believed you couldn’t get through in less that 20. Funnily enough, when he is conversing with Chewbacca it’s mentioned that he rounded down to 12 from his actual time, so where he may have gotten through in record time he exaggerated his accomplishment just as Han Solo would. One of the biggest things I was looking forward to seeing is how Han wins the Millennium Falcon from Lando and it’s executed here phenomenally well. You initially are led to believe that Han wins the Falcon gambling against Lando early in the film but Lando proves himself the ultimate swindler and cheats his way to victory. Then in the final scene Han tracks down Lando for a rematch and prior to the game he steals Lando’s cheat card and he doesn’t realise until it’s too late. I loved this callback and it sets up Han and Lando’s relationship excellently leading into A New Hope (1977). Han Solo’s dice have had an interesting role in the franchise as a whole. They first appeared very briefly as part of the minor decorations in the cockpit of the Falcon in A New Hope and didn’t appear in the films again until The Last Jedi (2017). In The Last Jedi they were used as a way of remembering Han but although we know they were Han’s dice it’s unclear how closely they are connected to him. Well in Solo the dice are featured throughout and seem to be Solo’s lucky charm for being able to drive and fly like a pro. Then the big moment happens and I’m impressed it was kept so under wraps because I didn’t suspect an appearance like this would EVER happen in the films. The big reveal takes place in Dryden Vos’ yacht where if you were paying attention you would have also spotted a Sith holocron on display. Following the death of Dryden Vos (Paul Bettany), Qi’ra (Emilia Clarke), knowing she can never escape being a part of the Crimson Dawn crime syndicate takes his ring and activates a hologram of a robed individual. Up until that point it was clear that Dryden wasn’t the highest ranking official and that he did report to someone. Then in an awesome moment the robed figure conversing with Qi’ra reveals himself to be Darth Maul played once again by Ray Park and voiced by Sam Witwer. But wait… didn’t Darth Maul die in The Phantom Menace (1999)? This is where those who have only watched the Star Wars films and are completely detached from the comics and animated series’ might be a little more confused than those who watched the Star Wars: The Clone Wars or Star Wars: Rebels animated series’. Darth Maul did get cut in half in that film but he survived the fall, ended up getting himself some robotic legs and going through a number of extensive story arcs involving Savage Opress, Darth Sidious, the planet Mandalore, and Darth Vader among others. If you watched Rebels you would also know that Maul finally meets his end when he tracks down Obi-Wan Kenobi on Tatooine, but at this time he is still very much alive. In the scene, Maul uses the force to pick up his lightsaber and ignite it, those with a keen eye will recognise it as the lightsaber he is wielding in the Rebels animated series. This indicates that this is featuring Maul between the events of The Clone Wars and Rebels. Awesomely the scene also features some subtle weaved in audio cues from “Duel of the Fates”, the best piece of Star Wars music. And he is wearing a necklace of what I recall is the Crimson Dawn logo indicating he is the head of this crime syndicate. Despite the fact that I knew Maul was alive during the time this story is set I didn’t think for a second that he’d appear here or in any live-action Star Wars film again. I thought this because it would be a little too confusing for casual Star Wars fans where to them Maul is long dead. I believed they’d keep his story to the comics and animated shows for the more involved fans but now he’s back in the mainstream and this could mean big things for the Solo sequels. Now assuming this movie is a box office success which it will be and people respond well to it you can bet we’ll eventually get a Solo sequel and where I wasn’t particularly excited for this movie I am very excited to see a followup. There are so many avenues they can take with the Han Solo character to where they can do a trilogy of Solo films as there’s enough content to use. You can have Jabba play into the future stories, Boba Fett could show up, and Maul could be the big bad ‘Emperor-like’ figure pulling the strings. The Maul reveal also gives Qi’ra an intriguing arc going forward as she’s stuck between two opposing sides. And now you already have established actors to portray both Han and Lando so the groundwork has all been laid down and it’s a matter of just making it and figuring out when in the schedule to release it. I used to be a little apprehensive about the possibility of 2 Star Wars films a year but with the massive schedule of planned films in order to get them out in under 10 years that change might have to be made. And if you think about it in the last year and a half we’ve had 3 Star wars films so it’s not that different. So that’s my spoiler review, if you are looking for my score you can find that HERE.